These days, it seems like there are more and more cat ladies declaring themselves to the whole world. At least for now, no one has to be embarrassed to be a feline fanatic. It's almost, dare i say, trendy to be a cat lady. 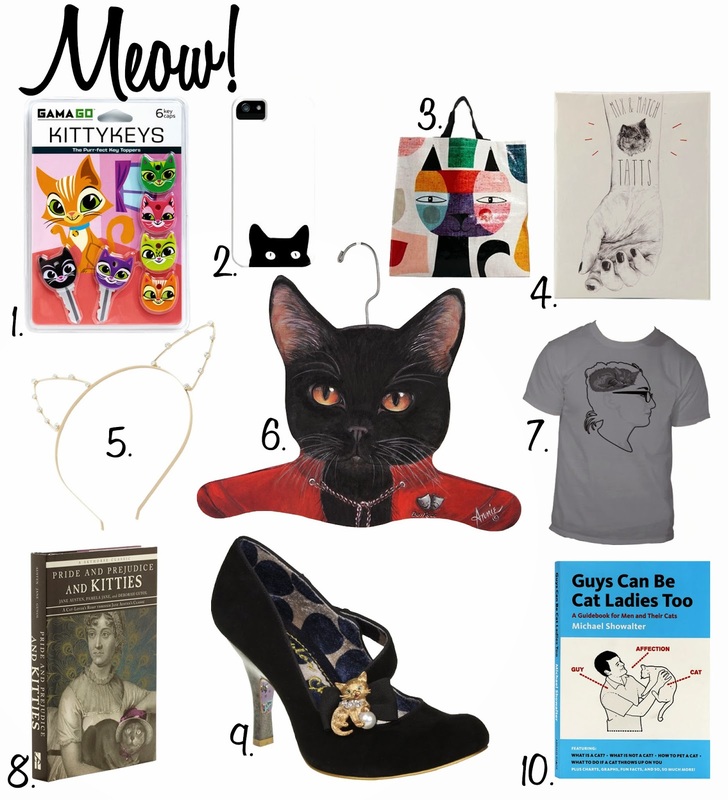 So, in today's gift guide, you'll find a collection of items you might consider purchasing for that special cat lady on your list. These are the purrfect gift (yes, I did just type that) for the cat lady who travel's a lot. This way, when she leave a key to her house for the cat sitter, the sitter will know exactly which one it is! This one is for the more subtle, minimalistic cat lady. It's just the suggestion of a cat. Great for the cat lady who likes to buy her cat food at Aldi and bring her own grocery bag. I once dated a guy who, on about the third dates said (in all seriousness), "you know, if you wanted to get matching tattoos, I would totally do that with you." That should have tipped me off right away. Oddly, he was the one who broke up with me. In any case, these little cat temporary tattoos are a bit more my speed, and they're much cuter. These may not be the every day item for most cat ladies, but they're pretty fun for party attire. Perhaps if your particular cat lady is fourteen or fifteen, they could be a fun hair accessory for school. Maybe your cat lady doesn't want an entire closet full of kitty hangers, but do not fear! They have other animals, too! However, the cat ones make it pretty easy to imagine what it would be like if your cat lady and her cat had matching outfits. And how amazing would that be? Ok, so full disclosure: this is a design from the Zazzle Spinster Store, which is mine. However, I think it's still a fun gift for a kitty lover. But then, pretty much any cat or kitten tee would be. First they had Pride and Prejudice, then there was Pride and Prejudice and Zombies. Now there's Pride and Prejudice and Kitties. Though the original was clearly amazing, I think the addition of cats and kittens will only serve to improve one of the most romantic stories evvaaa. Black shoes with a golden kitten playing with a pearl? class-ay! I think these are a must for your little kitten lover. This is just in case that "cat lady" is actually a cat man instead. Since there isn't much information out there about being a cat man, this may help him to understand the life he's living.